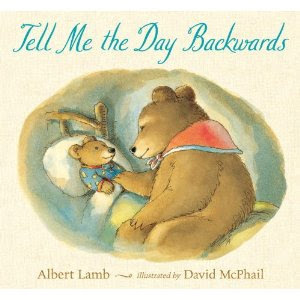 Tell Me the Day Backwards , by Albert Lamb is a super sweet story just released by Candlewick Press. It's a bedtime story (automatically cluing you in that it's good for a cuddle) in which young Timmy Bear and his mother recount the day's events - backwards. Timmy is climbing into bed when he asks his mother to play their old summer-time game wherein they list all the things that they did that day in reverse order. He starts by recounting the fact that he brushed his teeth before bed and talked back until he had woken up - from hibernation. It's a pretty full and busy day, full of memories that Timmy and his mother made together as they welcome summer back again! The illustrations by David McPhail are adorable to say the least. Using watercolors to bring Timmy Bear and his mother to life, the reader calmly plods through the story. It definitely sparks some conversation between the reading adult to the reading child about what it is that they participated in and managed to accomplish in their own day. A beautiful piece of work and a relaxing story. This one is definitely enjoyable! Thank you, Candlewick Press, for sending a copy for us to enjoy. I am also pleased to say that Candlewick Press has offered one copy of Tell Me the Day Backwards to one of my readers here at Reading to Know. To win? Simply leave a comment below. This contest is open to U.S. residents only and will be open through Thursday, April 7th. Awwww, that absolutely sounds like a book we would love around here!! What a sweet book...please include me. That does look super sweet! This does look sweet and we don't have many bed time books. new baby coming...new bedtime books a must! I love bedtime books and cuddles! I hope I win!! Count me in! This looks super cute! Seems like such a sweet book! I think my daughter would love this book! Thanks for the chance to win. Sounds like a must read book. What a cute idea for a book. My little granddaughter would love this. Think we'll start doing that together - telling our days backwards! What a fun idea of going over the day in reverse order! The cover reminds me of Beatrix Potter watercolor illustrations. Sweet, gentle and fun.